Hi Everyone! Amarilys here sharing with you some of my Joyeux Noel December Kit projects! 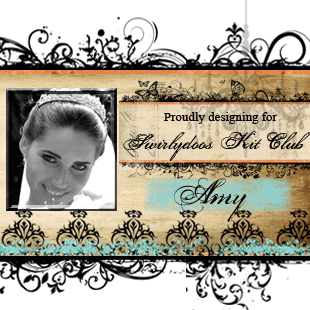 I just loved this kit and had so much fun working on these layouts and projects! My hubby and I did our own mini Christmas photo session last year and we had a lot of fun doing it! We laughed and teased each other, all the while clicking away (we have a hand held clicker for taking our own pictures!) and these are some of the more fun pictures from that session! I turned these photos B&W and printed them 3"x4". I used the gorgeous huge red poinsettia and some of the smaller red poinsettias from the Add On Flower Kit. I painted the corrugated cardboard (box where my kit came it!) with brown and white acrylic paint and then added some random splatters of the gorgeous Lumin'arte Silks Glaze Paint - Love Struck included int he kit! I also painted my chippie title with it! I just love how this second layout turned out! My mother in law took this picture of my hubby and I on Christmas day in front of our tree last year and I just LOVE it! Our tree was white, silver and blue but we wore red and green so I kept the colors on this layout to a minimum to make the picture the focal point. I used all the neutral embellies in the kit and on the Add On Flower Kits for this layout. The title chippie and cheese cloth are from my stash. I kept it pretty simply and not too thick for mailing purposes. I pop dotted the ornaments and hand stitched the strings holding the ornaments with brown floss to add some texture. I also punched and added green oak leaves to my tree. I finished it off by distressing the edges and machine stitching the card front unto my card base.